Water goblets, flutes for champagne and sparkling wine, red wine glasses for Pinot Noir, Bordeaux, Burgundy, Cabernet Sauvignon, white wine glasses for Chardonnay, Viognier, dessert wine glasses for Port, Madeira, Sherry, Sauternes. All are similar with a bowl, stem and foot but differ in shape depending on beverage of choice. Shapes can be a vintage coupe style, modern flute, tulip, large bowl or small bowl. 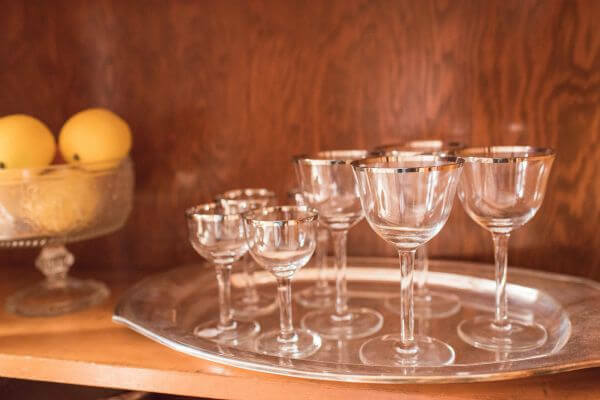 Vintage Grace will help you find beautiful vintage stemware to add to your tablescape. The detail and craftsmanship displayed in old stemware is to be admired.